Eduard Folayang Vs Ev Ting Full Fight Prediction: Who Will Win The Fight? For their next event dubbed Kings of Destiny, One Championship will return to the Philippines at the Mall of Asia Arena in Manila. 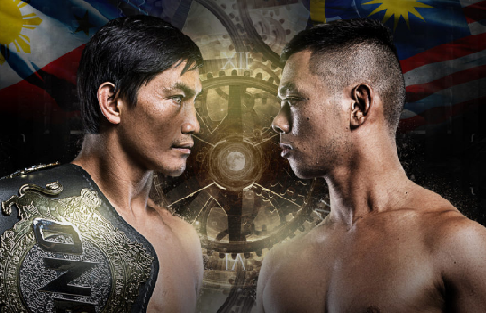 Headlining the card is a championship battle between hometown hero Eduard Folayang and Malaysian mixed martial arts star Ev Ting. The highly anticipated bout will be held on April 21, 2017. Folayang will be defending his ONE Championship lightweight strap for the very first time. This is one of those fights that is quite difficult to predict. Both fighters seem to be evenly matched if you are to look into their records. Folayang currently has a record of 17 wins and 5 losses while Ting has 13 wins and 3 losses. Needless to say, Folayang is the more experienced fighter. He has 10 fights in ONE Championship compared to Ting's 8. Folayang has also faced much better competition since he has faced off with the likes of Kamal Shalorus, Kotetsu Boku, Timofey Nastyukhin, and Shinya Aoki. Not to be outdone, Ting leveled up during his last several fights against touch and well-known martial artists like Kamal Shalorus, Rob Lisita, Honorio Banario, and Marat Gafurov. When it comes to experience and level of opponents, Folayang has the upper hand. Like a lot of the fighters coming from the Team Lakay gym, Folayang tends to put a lot of pressure to their opponents, drag them to the ground, and go for the knockout with ground and pound. Ting, on the other hand, is a more polished striker. He sets up his punches and kicks while standing up unlike Folayang who often resort to wild striking. Proof of Ting's better technical striking is the fact that he won two of his fights by head-kick knockouts. He mixes up his striking with punches and kicks. Folayang does the same thing but he's more wild with his offense. In a nutshell, Ting has better striking. As to power, Folayang may have a slight advantage. Folayang has 2 submission wins. Ting has 4. At first glance, it looks like Ting has the upper hand in this department. If you are to watch previous fights of both fighters, it's apparent that Ting has more well-rounded skills during ground fights. He tends to go for a submission when the fight goes to the ground. Folayang, on the other hand prefers to ground and pound his opponents. Ting may be a submission specialist but we can't discount the fact that Folayang has never been submitted inside the ring. Let's keep in mind that he got his lightweight belt by defeating Shinya Aoki, one of the most decorated submission experts in MMA. Folayang survived all of Aoki's attempts to submit him. This speaks a lot about Folayang's submission defense. So yeah, Ting has better submission skills but this will be negated by Folayang's great submission defense. Folayang is two inches taller than Ting. He is also naturally much bigger than the Malaysian fighter. This will have an effect during the fight as Ting often struggles with taller fighters. Folayang is good in using his size to put pressure on his opponents. Ting will be in a lot of trouble if Folayang antes up his pressure and not allow the Malaysian to set up his striking offense. This is going to be a close bout because the fighters are evenly matched. If the fight plays standing up, Ting can pick his shots and score points. That is if he has an answer to Folayang's pressure. There's the possibility that Folayang's pressure will be too overwhelming for Ting. If the fight goes to the ground, there are two possible outcomes: Folayang by ground and pound or Ting by submission. This should be a very interesting bout. We can't wait.